On Monday, February 20, we will have a Presidents' Day Sale! All regularly priced items in the store will be 20% off! Plus, if you buy the rest of the bolt of one of our sale fabrics (priced at $5-$6/yd), we'll give you an additional 15% off the sale price! Sweet!!!! This is the day to buy backing fabric, to get that notion you've been wanting but just didn't want to spend the money for it, and to buy yardage for you next projects and/or your stash. Foundation Paper Piecing BOM. Have you always wanted to try Foundation Paper Piecing but did not know where or how to start? If so, then this Block of the Month is the class for you. In this class we will begin with the simpler blocks to get your feet wet and progressively get to the more complicated blocks. 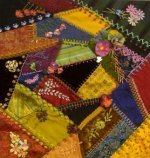 By the end of 2017 you will have a beautifully pieced quilt, a quilt to cherish for years and years, and a great understanding of foundation paper piecing as well. 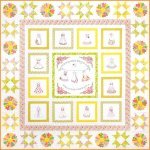 Foundation Paper Piecing is very accurate, very addictive, and a very fun way to quilt. Come and join Dana and she will show you all the tips and tricks. 3rd Tue beginning Feb 21, 2017, 5:30 - 8:30 p.m. (Full), -OR- 4th Wed beginning Feb 22, 5:30 - 8:30 p.m., Dana Lahargoue, $20/class. Students must pay for 3 sessions at a time ($60). Crazy Quilting - Beginning. 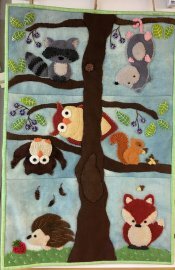 In the first session you will construct a 14" block using a wide variety of fabrics; cottons, silks, tapestries, velvets, linens. In the second session you will start the embellishments. You will learn a variety of embroidery stitches using different threads and techniques. In the third session, you will learn more embroidery stitches and embellishment techniques using buttons, laces, jewelry and other "finds". Toni Jordan; Sunday, March 5, 11:00 a.m. - 3:00 p.m., Sunday, March 12 & 19, 11:00 a.m. - 1:00 p.m., $70 for 3 sessions, supply list. Wool Applique Pillow. This beautiful pillow is the perfect introduction to wool applique. 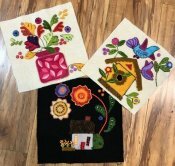 Beth will show you how to applique on wool and then teach several embellishment stitches to add dimension and a very unique look to your project. You will learn backstitch, chain stitch, bullion knots, French knots, and more. 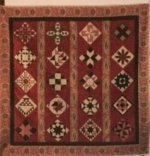 Beth Kondoleon, 3 sessions - Wednesday, March 15, April 19, and May 17, 10:00 a.m. to 1:30 p.m., $60 teaching fee, $60 for kit (includes all wool and wool threads needed). 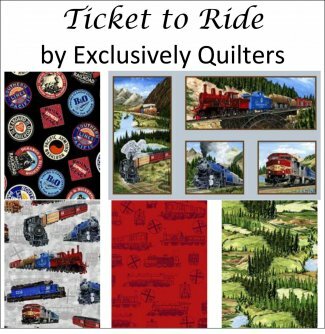 Students will need to purchase the book and embellishment threads. Summertime Sampler. Celebrate summer with this jewel-tone, whimsical wool sampler. The blocks in the book are beautiful with simple stitches, but Beth will help you take yours to the next level by adding more embellishment stitches. Come into the shop to see the three blocks that Beth completed (pictured here), and we're sure you'll be hooked. You will sign up for three classes at a time (one block per class). Beth Kondoleon; 1st Sunday - Apr 2, May 7, June 4; 12:30-3:30 p.m., $60 for three sessions. Students must purchase the book, Summertime Sampler, and other supplies. We’ve received additions to some of our basic fabric lines – Grunge, Dimples, and solids – and we’ve also received new fabrics from the Kaffe Fassett Collective. We also have a new addition to our novelty section – A Ticket to Ride, pictured here. We’ve added some new trims (including 3/8” and petite ric racs) and charms for the Crazy Quilting class. And for all you wool enthusiasts, we have a gorgeous new bobbin sampler pack of Silken Pearl #5. 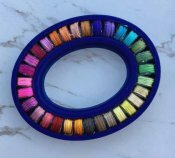 There are 31 bobbins with approximately 5 yards on each bobbin!